If, in 1977, WLS mornings were programmed for the moms, afternoons were definitely targeted at the boys, all those tween and teen coming home for school and young adult males commuting home from work. And the catnip of choice for capturing this crew: AOR - Album Oriented Rock. Though these starkly middle-of-the-road rock and prog-rock acts didn't do nearly as much damage on the singles charts as their counterparts featured on Vol 12 - Lujack Mornings, they would prove as a group to be even more enduringly popular... with most, in some bastardized form or another, still active on the nostalgia circuit today and still omnipresent on classic rock radio playlists. And while I poke fun at some of these bands in write-up as I now view them from a much older perspective, let the record show that there is no overstating how much joy they brought me back in the day. 1. Feels Like the First Time - Foreigner: When word broke that Ian McDonald, the multi-instrumental genius responsible for all those crazy sounds one hears on the King Crimson's 1968 prog-classic In The Court Of The Crimson King, was leaving Crimson to form his own band, expectations ran high as to just how great the new act would be. What no one anticipated was that McDonald was about to go full-on Greg Rollie/Neil Schon - leaving a popular cutting-edge act to create something as middle-of-the-road-safe and mass-marketable as music comes. And like many of the songs on this mix, middle-of-the-road mass marketable with a heavy prog accent is exactly what Foreigner's eponymous debut turned out to be. But that doesn't mean it wasn't fun, and the masses ate it up, making Feels Like The First Time - one of three top-20 hits from the album - the band's highest charter in the weeklies, peaking out at #4. 2. Point Of Know Return - Kansas: Following the huge success of the single Carry On Wayward Son from their multi-platinum-selling '76 release Leftoverture, the midwest's biggest prog-rock act ever hurried back even stronger in '77 with Point Of Know Return, which in addition to doing even better sales than Leftoverture, included two of the band's greatest songs (starting with the title track here), and is now almost universally regarded as Kansas's best album (though, let's be honest, that's not saying a ton). And while this band's pretensions have proved as enduringly entertaining in a campy nostalgic sense as those of their midwest prog-rock counterparts we'll get to in a moment, this track still brings up a lot of warm memories. 3 & 4. 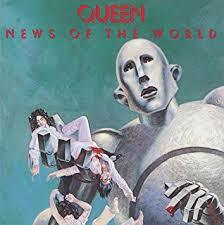 We Will Rock You & We Are The Champions - Queen: If you caught Bohemian Rhapsody the move, you know this pair of songs from their '77 release News Of The World were written in an effort to increase audience participation at their shows Mission accomplished. 5. 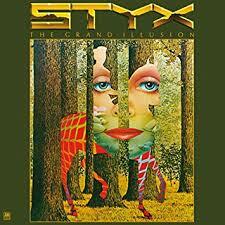 The Grand Illusion - Styx: Wow. Styx. The Grand Illusion. Combine Kubrick-level pretension with Ed Wood-level insight, and this is what you get. Though on an instrumental level they could clearly hold their own, few bands have ever strived for deep meaning harder and missed the mark more consistently than Roseland, Illinois's um..., finest? But whatever their lyrical ineptitude (and it could get comically bad), they could find their way around a riff and a hook, making the one of the most appealing and greatest of the 70's "bad" bands. We'll be hitting not one, not two, but three tracks from the band's '77 breakout album here on this mix, starting with the album's magnum opus (a least until Mr. Roboto) opening track here. 6. 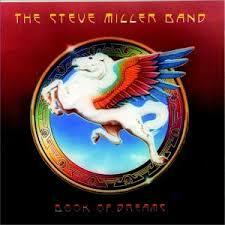 Jungle Love - Steve Miller Band: As middle-of-the-road-safe as The Steve Miller Band was (and let's be clear, they don't come more middle-of-the-road safe than The Steve Miller Band), I have nothing but good things to say about Miller's hits-packed '77 release Book Of Dreams. It may not challenge its listeners, but it remains a super fun listen. So we kick off our Book Of Dreams appreciation fest with Jungle Love here, a song originally written for Dave Mason. 7. 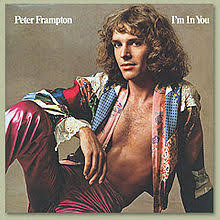 I'm In You - Peter Frampton: The title track to Frampton's Comes Alive '77 followup, I'm In You the song had the distinction, in addition to being the year's #42 song, of drawing the mocking ire of Frank Zappa, who annoyed by Frampton's shift in direction from a respectable if earnest rocker to blatant teen idol chart climber, rerecorded his version of the song as I Have Been In You. 8. Black Betty - Ram Jam: Flirted with putting this one-hit-wonder from Ram Jam's full-length debut on Lujack Mornings, but the harder-rocking vibe of the New York-based act's cover of the ages-old prison work song that had been recorded many times since the 1930s (most notably by bluesman Leadbelly) suggested it go here. 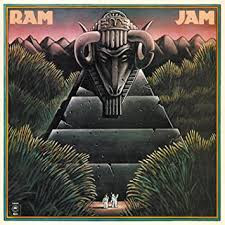 And a little trivia, though Ram Jam's version of the song did cause a minor stir with the NAACP (who felt Ram Jam's version presented a negative portrait of African-American women), most interpretations of the song suggest that Black Betty of the title is actually not a woman, but a reference to one of many objects associated through the years with African American oppression - a prison guard whip, an eighteenth century musket, a paddy wagon, a nasty bottle of home-brewed alcohol. 9. 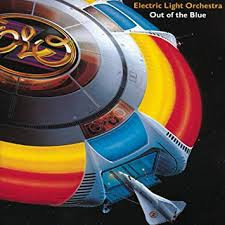 Sweet Talkin' Woman - Electric Light Orchestra: I've never been a big ELO fan (or a fan of any Jeff Lynne-led project through the years, from The Move all the way to those god awful Traveling Wilburys). I always felt, too often, Lynne stole everything he could from the Beatles - except what worked. But as sappy as the band's full-length albums like '77 double Out Of The Blue (the second best-selling soft-rock album of 1977 after Rumours) could be, the band definitely delivered a some priceless hits. We're including two of Out Of The Blue's big three (sorry Mr. Blue Sky) on this mix, starting with Sweet Talkin' Woman here. 10. 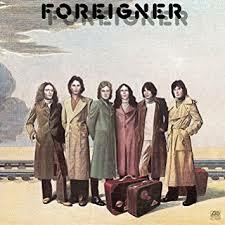 Long, Long Way From Home - Foreigner: God, it doesn't say much for my youthful tastes, but I ate this song up in junior high. It hasn't aged as well as Feels or Cold As Ice, but it would be the third and final single cut from Foreigner's debut to make the charts, peaking at #20 on the Billboard weeklies. 11. 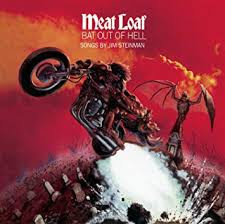 You Too the Words Right Out Of My Mouth (Hot Summer Night) - Meatloaf: One last cut from Meatloaf's Bat Out Of Hell. It's not as good a song as the album's title track, but I couldn't leave this one off, the spoken-word intro by songwriter Jin Steinman is just too priceless. 12. Fooling Yourself (The Angry Young Man) - Styx: "Relax... Take it easy..." The Grand Illusion, in addition to being the band's breakout album, was also the band's first album to fully integrate new member, singer/songwriter/guitarist Tommy Shaw. In addition to bequeathing upon Styx the most generic blond-haired / blue-eyed pretty-boy rocker of all-time, Shaw was also about to deliver a number of huge hits, starting with these oh-so-cheesy words of encouragement for bandmate Dennis DeYoung, whom Shaw felt was wound tighter than a clock and overreacted to every little setback. 13. Give A Little Bit - Supertramp: Apologies to Emerson Lake and Palmer, Yes, and Jethro Tull, classic prog-acts who all released significant albums in 1977 but that I chose not to profile because they just didn't fit with the more mainstream-oriented feel of this mix. 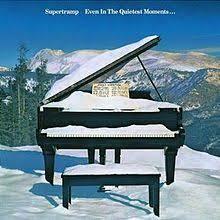 But Supertramp's Give A Little Bit, which, as the lead single from the band's fifth studio effort Even In The Quietest Moments, was the band's breakout hit in the states, did. 14. Swingtown - Steve Miller Band: Though the final single released from Book Of Dreams, the light, breezy Swingtown would perform better than Jungle Love on the charts, peaking at #17 on the Billboard weeklies. 15. 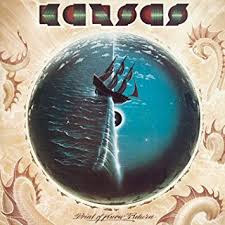 Dust In The Wind - Kansas: For all of Point Of Know Return's over-heated Kings-and-Queens-and-Fairies prog ramblings, it would be the album's simplest track that left the biggest mark. And for as much as I've been poking fun at the songs on this mix, and despite the doom-and-gloom fatalism of this song's lyrics, there's really not much to make fun of here. Dust In The Wind is just a well executed, well produced, Brit-styled folk-ballad, anchored around one of the most iconic finger-picked riffs of all time. 16. She's Not There - Santana: I don't know about you, but I've always loved Santana's jammy '77 cover of the 1964 Zombies classic. 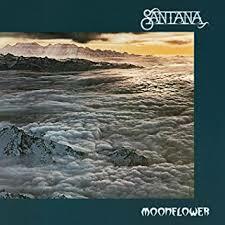 The public did, too, turning the cover version into a UK and US smash, and turning the album on which it appeared, '77 double-album Moonflower, into Santana's first gold record since 1972. 17. Turn To Stone - Electric Light Orchestra: Turn To Stone was the first of four singles released from ELO's ten-times-platinum Out Of The Blue. It would end up the worst performing single from the album, but no matter, it's always been my all-time favorite song from the band. 18. Cold As Ice - Foreigner: Though it wasn't the band's highest weekly charter from their self-titled debut, Cold As Ice would go on to be the best selling single from the album, finishing as 1977's #68 song, and in the process would become the band's most well known song. 19. Jet Airliner - Steve Miller Band: Book Of Dreams biggest hit had actually been first written and recorded by blind bluesman Paul Pena in 1973, but conflicts between Pena and his label would prevent his version from being released for another twenty-seven years In the interim, Ben Sidram, who had produced Pena's album and had also previously been a member of The Steve Miller Band, brought the song to Miller, who tweaked it and made it (along with Threshold, the synth-intro that usually accompanies it in tandem but is not included here) Book Of Dream's opening track. Miller's version would peak at #8 on the Billboard charts. 20. Come Sail Away - Styx: Ranking right their with Lady and Renegade as Styx's greatest guilty pleasure track, Come Sail Away would be a monster hit for the band, peaking at #8 in the weeklies, and along with The Grand Illusion, launch Styx on a half-decade ride as one of America's top-earning acts. 21. 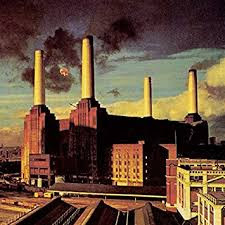 Pigs On The Wing 2 - Pink Floyd: So yeah, Floyd and Animals are awesome, and even though a prog band, are of such higher quality level than the other acts they probably shouldn't be here. But I had two minutes of space remaining on this mix, and I do love those short Animals bookends, so Pigs On The Wing 2 gets to close things out.